Hear from a panel of 2L and 3L international students discuss how they navigated EIP, from preparing for the interviews and researching visa policies, to choosing their employers. Judge Trevor McFadden of the Federal District Court for the District of Columbia will join the Federalist Society to discuss the difficulties of conducting trials in administrative law disputes. Chick fil a will be served. This is a space to share and reflect on what we learned at the CRT conference (April 12-13) and discuss moving forward with organizing for Critical Race Theory course offerings and faculty hiring. All who attended the conference or are interested in advancing these goals are welcome. Please join three Skadden M&A attorneys as they discuss their practice group and OCI-related advice. Lunch will be provided. The 2019 Class Marshals invite the graduating class to join us for the first event in our Last Lectures Series, featuring Professor Klarman. The Last Lectures are a tradition for the graduating class which provide students with an opportunity to hear selected HLS Professors impart words of wisdom before we leave HLS. Lunch will be provided. Coffee Chat with Suzette Long, Chief Legal Officer of Caterpillar Inc. The Gary Bellow Public Service Award was created in 2001 to honor Professor Gary Bellow, his commitment to public service, and his innovative approach to the analysis and practice of law. Each year, the Gary Bellow Public Service Award recognizes students who—like Professor Bellow—exemplify how lawyers can litigate, educate, advocate, and organize to promote social justice. Join us to celebrate the winner and finalists, who will give talks on their public service experience. Join The Harvard Law Entrepreneurship Project for drinks and hors-d’oeuvres with our Spring 2019 clients, attorney advisers, and law firm sponsors. This is a great opportunity to learn about our spring client projects, make new connections, and catch up with old friends. All clients, attorney advisers and HLS students interested in HLEP are invited to attend. Join CSEL and JSEL for an end of year lunch! Join ACS, the HLS Democrats, and the JD/MPP Joint-Degree Students Association for lunch with Justin Levitt and a discussion of election law and voting rights. Professor Levitt is an american constitutional law scholar at Loyola Law School. He previously worked at the U.S. Department of Justice in the Civil Rights Division as a Deputy Assistant Attorney General. He was the National Voter Protection Counsel in 2008. Jigyassa Sharma will be speaking about quality of care for pregnant women in low- and middle-income countries, with a focus on mistreatment of women during facility-based care. 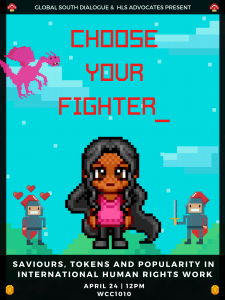 Sponsored by Harvard Law Student Alliance for Reproductive Justice. Join Sarah Stuart, HLS alumn and mindfulness expert, for a discussion about the practice of mindfulness and how mindfulness techniques may support you during the finals period. Please come listen to students returning from Palestine. 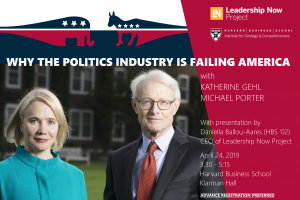 Katherine Gehl, Former CEO of Gehl Foods, Inc., and Political Innovation Activist, and Michael Porter, Harvard University Professor, have used classic business school tools (Porter’s Five Forces) to analyze politics as an industry. In this session they will discuss the Gehl Porter Politics Industry Theory and participants will leave with an understanding of how our political system actually works, what is driving poor outcomes, and, most importantly, a comprehensive strategy for how we can recapture our democracy.